Mouse anti Human CD71 antibody, clone DF1513 (MCA1148) used to evaluate CD71 expression on erythroid cells during differentiation by flow cytometry. Level of RBC membrane proteins in BEL-A compared to normal adult erythroid cells during erythropoiesis. BEL-A cells in expansion medium (undif), and at day 4 and 10 following transfer to differentiation media, and erythroblasts differentiated from adult peripheral blood CD34+ cells at day 5, 12 and 21 in culture were incubated with antibodies to the proteins indicated and analysed by Flow Cytometry. Histograms illustrating fluorescent intensity of BEL-A cells incubated with antibodies to indicated proteins at labelled stages of differentiation. Percentages refer to percentage positivity. From: Trakarnsanga K, Griffiths RE, Wilson MC, Blair A, Satchwell TJ, Meinders M, Cogan N, Kupzig S, Kurita R, Nakamura Y, Toye AM, Anstee DJ, Frayne J. 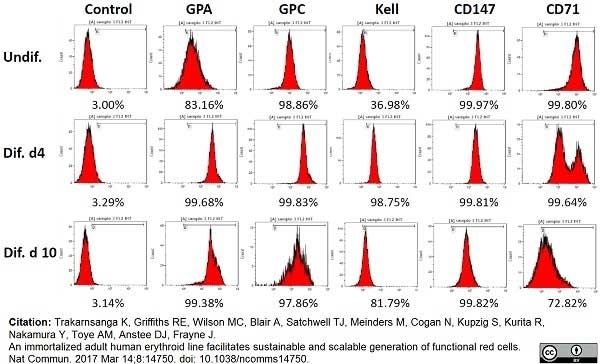 An immortalized adult human erythroid line facilitates sustainable and scalable generation of functional red cells. Nat Commun. 2017 Mar 14;8:14750. Spleen cells from immunized BALB/c mice were fused with cells of the mouse NSI myeloma cell line. Use 10ul of the diluted antibody to label 106 cells in 100ul. Sopper, S. et al. (1997) Lymphocyte subsets and expression of differentiation markers in blood and lymphoid organs of rhesus monkeys. Meng, J. et al. (2011) Contribution of human muscle-derived cells to skeletal muscle regeneration in dystrophic host mice. Stockwin, L.H. et al. (2009) Artemisinin dimer anticancer activity correlates with heme-catalyzed reactive oxygen species generation and endoplasmic reticulum stress induction. Int J Cancer. 125: 1266-75. Janes, P.W. et al. (1999) Aggregation of lipid rafts accompanies signaling via the T cell antigen receptor. J Cell Biol. 147: 447-61. Makoveichuk, E. et al. (2012) Inactivation of lipoprotein lipase occurs on the surface of THP-1 macrophages where oligomers of angiopoietin-like protein 4 are formed. Biochem Biophys Res Commun. 425:138-43. Procaccini, C. et al. (2012) Leptin-induced mTOR activation defines a specific molecular and transcriptional signature controlling CD4+ effector T cell responses. Weissgerber, P. et al. (2003) Investigation of mechanisms involved in phagocytosis of Legionella pneumophila by human cells. FEMS Microbiol Lett. 219 (2): 173-9. Trakarnsanga, K. et al. (2017) An immortalized adult human erythroid line facilitates sustainable and scalable generation of functional red cells.